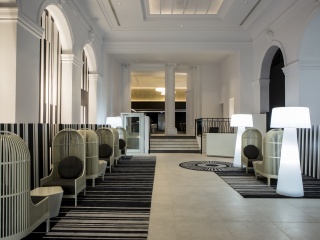 Interior architect Jean-Philippe Nuel has breathed new life into the Cures Marines in Trouville by redeveloping a five-star hotel that also houses a thalassotherapy institute and spa. 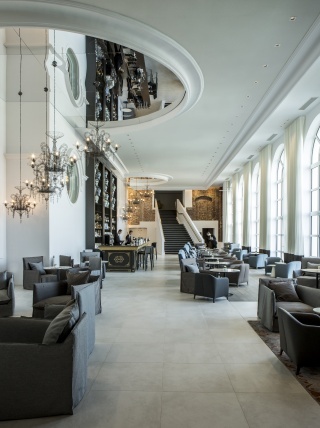 For the flooring for all the water features in the new establishment, he opted for Terra Maestricht tiles, the subtle tones of which harmonize well with the colours of this seaside resort on the Normandy coast. Having received various awards for his creations in the hotel industry worldwide, Jean-Philippe Nuel could not have found more fertile ground in this sector to practice his art. In every project he undertakes, he loves to rethink the identity of the place while remaining fully faithful to the atmosphere of his environment. In renovating Cures Marines, he has completely remodelled the spaces in this seaside establishment next to the town's casino that flourished in the Belle Époque. The result is a hotel with 103 rooms, six of them suites, conference facilities plus a thalassotherapy institute and spa with two large pools. Each of these spaces has found a choice situation in the beautiful volumes that make up this majestic building clad in bright white pearl facing the sea. So that the hotel is at one with its environment, the pre-works design also came up with a colour chart, the dominant shades being the blue grey of the Norman sky, the blue expanse of the English Channel on which Trouville stands, the lightly coloured wooden planking to walk on alongside the sea, and its golden sands. "Each of these spaces has found a choice situation in the beautiful volumes that make up this majestic building clad in bright white pearl facing the sea." Envisaged by the architect more as a space exuding well-being and peace rather than purely therapeutic, the thalassotherapy institute and spa are built on two floors below ground level. To underline the seamless continuity of the outside with the inside, boards reproduced in wood-effect tiling welcome us into the institute and extend along the central part into the changing rooms while from one side to the other the floor tiles are in eggshell Terra Maestricht. The tiles then follow the access steps to the various treatment booths on the floor below and continue as far as the two balneotherapy pools. Reminiscent of the beneficial effects of the sea, the walls of the various spaces are punctuated by the striped patterns evocative of the beach shelters and by large reproduced photographs. The photographs show bathers swimming in the sea and elegantly dressed ladies strolling along the beach. Here, Terra Maestricht tiling in agate grey adorns the two shower jet rooms and other facilities from floor to wall and clads the lower part of the walls of all the individual treatment booths. The edges of the two pools are embellished by bands in the same tiling, alternating agate grey and eggshell white, echoing the striped pattern. "Reconnecting with the pomp of nineteenth-century luxury hotels." Jean-Philippe Nuel has been familiar with Mosa tiles for quite some time, choosing them for their many strengths. Amongst other things, the architect appreciates 'the perfect resistance of Mosa tiling, compliance with anti-slip standards, and coherence with his personal aesthetic taste, all combined with the rich subtlety of the colours offered. This is Mosa's true signature.' Moreover, the architect believes the sandstone ceramic offers 'an excellent solution in terms of texture and matter, with the added value of the tiling'. 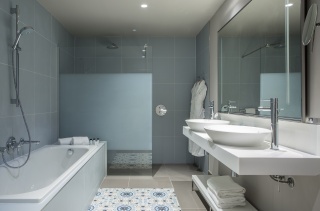 The added value of the tiling is reflected in the various areas where Mosa tiles have been installed. Examples are the bathrooms and lavatories, which are tiled with Terra Maestricht in agate grey. The floors and walls in the conference area are fully clad in large 24 x 24 inch tiles, for a luxurious look and feel. On the five floors of the hotel, all rooms reflect the seaside environment and make one feel as if time has stood still, reconnecting with the pomp of nineteenth-century luxury hotels.